The controversial Google “Tips,” where Google promoted certain of their own products over organic search results, have been quietly pulled down. 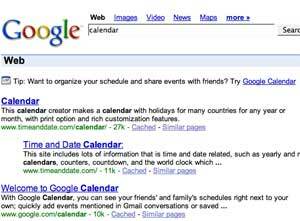 Until recently, Google searches for Calendar, Blogging, Photo Sharing and others returned “tips” above normal search results suggesting users try Google Calendar, Blogger and Picasa, respectively. Firefox co-founder Blake Ross criticized the change in a widely read blog post, and the rest of, the world generally piled on. Even Google’s Matt Cutts had said he’d turn them off if he could. There’s been no official announcement on this by Google, so the removal could be temporary. My guess is they are gone for a while, though, based on the overwhelmingly negative feedback from bloggers.